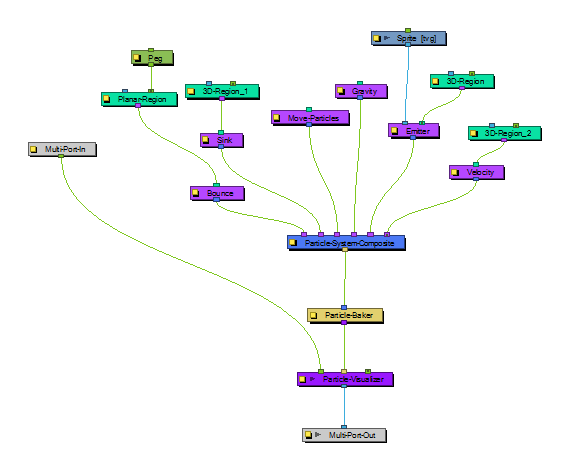 Use this module to make your particles bounce off a surface with realistic physical modeling. 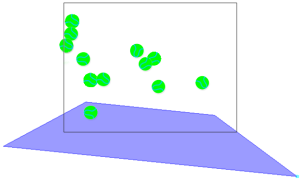 This module should have a region connected to it, and that region will act as a bounce plane so that when any particle hits it, it will bounce off at the correct angle. 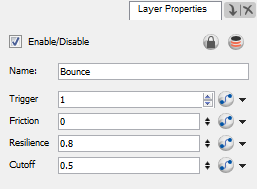 Use the Bounce's Layer Properties panel to adjust the effect's parameters. • Friction: Enter a value into this field to increase the amount of friction that each particle experiences as it makes contact with the planar surface. A positive value creates more friction and therefore slows the particle down. A negative value lessens the friction and therefore makes the surface appear more slippery. • Resilience: Changing this value effectively increases or decreases the bounciness of the particle. A value of zero causes the particle to hit the planar surface once and slide off any downward facing angle. A positive value, even by decimal increments, causes the particle to become bouncy. A negative value deadens the effect, the same way a lack of Region would. • Cutoff: Increasing this value widens the bounce arc. If the connected Planar Region is completely flat, a value of zero will cause the particle to bounce up and down in place. A tilted plane in the direction of the bounce will also widen the arc.